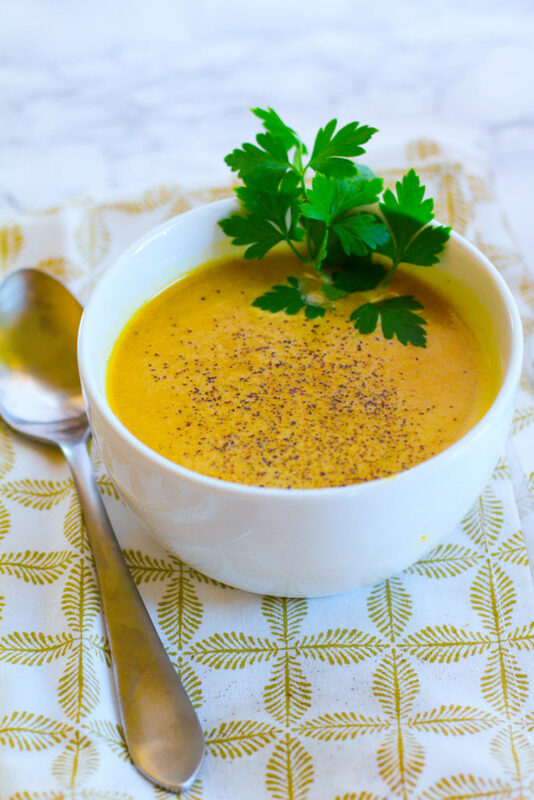 Creamy, savory roasted butternut squash is a perfect soup to sip on this fall! 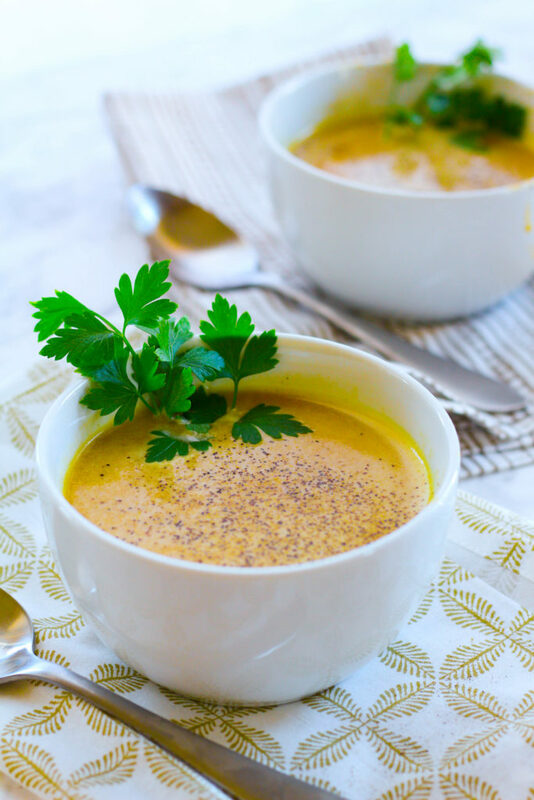 Easy to make, this soup can be thrown together quickly. Happy Monday! I hope you had a great weekend. We’re only three weeks away from the wedding at this point, so life feels a little crazy right now. I know that I haven’t been able to keep up with my posts as regularly as I normally do but hopefully after the wedding I can pick things up. Over the weekend, my future mother and father in law came over to watch the Cowboys game, and they gave us our wedding gift! They were very generous and gave us a full set of Calphalon non-stick pans and a Wustof knife set. I cooked dinner on my new pans last night and sliced veggies with high-end, super sharp knives and it was like a dream. And let me tell you, if you don’t have a good set of knives, seriously think about investing. It was like slicing through air and took no effort to slice bell peppers, tomatoes, and cheese. I’m so excited to have nicer kitchen equipment. Last week, I did a cooking demo with Sprouts Farmer’s Market to showcase one of their products. Bone broth has been rising in popularity in the foodie world, and for many good reasons. It sounds foreign, but bone broth has actually been around a really, really long time. 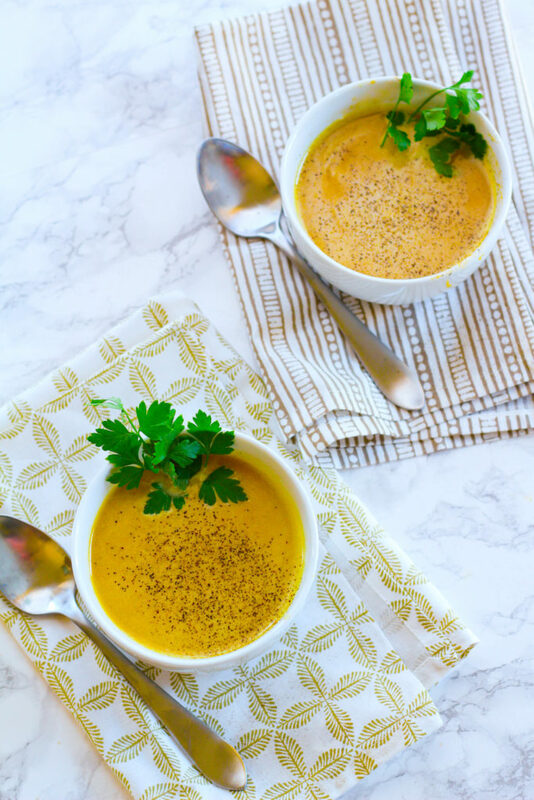 Most cooks know bone broth as chicken stock or beef stock — soup bases made by simmering bones in water with seasonings for as long as two days. Bone broth is tasty and is a wonderful base for all sorts of soups and stews. Bone broth is also a fairly good source of protein, containing 6 to 12 grams per cup. These amino acids can help the body repair muscle, and if you add dairy (such as low fat milk, half and half) you are adding more protein, calcium and minerals to increase the benefits. 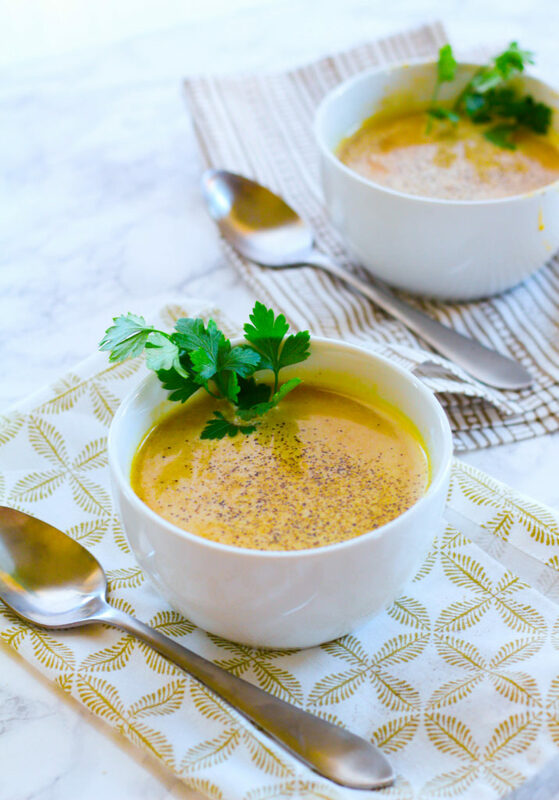 That’s why this soup contains both bone broth and milk! Bone broth (bones, water, vegetables and herbs) is simmered for 24 to 48 hours, compared to stock and broth which are simmered for shorter amounts of time (6 hours and 1 hour respectively). Slow cooking the bones with a small amount of acid helps to release the calcium, magnesium, phosphorus, glutamine and glycine into the liquid along with many other amino acids. So, now you know the benefits of bone broth! One more I forgot to mention– it’s also very low in sodium, about 90mg per cup. This means you get to control how much salt is added to your soup! Preheat your oven to 400 degrees F. Spray a baking sheet with cooking spray. Toss the diced squash lightly in olive oil. 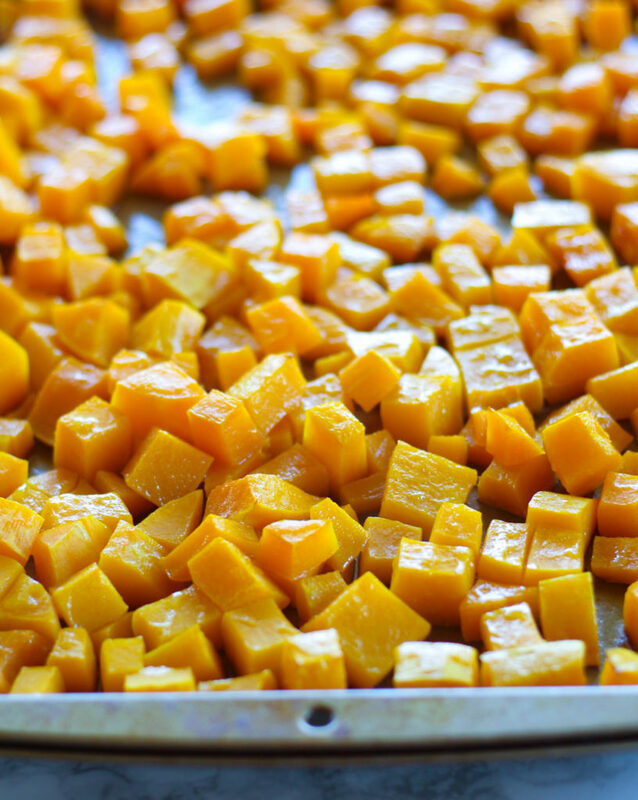 Spread out on the sheet and roast for 30 minutes, until the squash is fork-tender. In a large pot, add the squash, bone broth, salt, pepper, thyme, nutmeg and brown sugar. Heat until the liquid just starts simmering. Remove from heat. With an immersion blender, puree the soup until smooth. Stir in milk and season with more salt and pepper. Hi! I’m Emily, Registered Dietitian Nutritionist and self-taught intuitive chef. I firmly believe that cooking is the simplest and most important step we can take to improve our minds and bodies and build healthier communities. Join me and let’s bring food back to the kitchen! i have to try bone broth more frequently..and i didnt know acid helps release more minerals..lovely recipe! yes – sharp knife is everything!